Summary: Manage list of quick links to other search engines. Adds customizable list of quick links to other search engines. 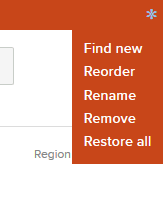 Once you have edited the list, save your actions or press cancel to revert the changes.